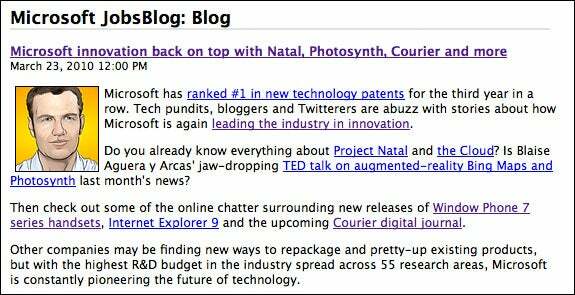 The reference to the Courier by the HotJobsBlog linked to a recent Engadget post discussing new rumors about Microsoft's purported dual-screen digital notebook. Engadget said the Courier wouldn't be much bigger than a 5x7 photo when closed, would be under an inch thick and based on the same software kernel as the Zune HD, Microsoft Pink Project and Windows Phone 7 Series. So did Microsoft confirm the latest rumors by linking to the gadget blog, or was this simply an overzealous blogger who didn't know when to quit? It's hard to know for sure. It's probable that the Microsoft blogger didn't have any first hand knowledge of Microsoft's product plans, and may have based his statements on interesting rumors found online. Then again, as All Things D's Peter Kafka points out, sometimes technology companies like to play mind games by "leaking" information to create anticipation around a new product. So far, Microsoft isn't providing any official comment about Courier, but every now and then a fresh rumor about the device pops up, purportedly from anonymous insiders. Courier is designed to be a small, dual-screen notebook that accepts multitouch and stylus inputs. It can browse the Web, organize notes, take and store photos, function as a day planner and may also have e-reading capabilities. The device looks very interesting, and would be a worthy response to Apple's recently announced iPad. But so far all we've seen of Courier are computer generated videos. So it's not clear how close an actual Courier device would be to its original concept, since Microsoft--like many other technology companies--is well known for producing concept videos that never result in an actual product. So what do you think? Did Microsoft leak the truth about the Courier project or was this just a mistake by an overeager member of Microsoft's PR team?